A welcome return to an earlier experience that was widely beloved allowing you to revisit everything you enjoyed about the original while getting some new elements to admire as an added bonus. A foul term for an odious scam designed to reward somebody’s patronage by rehashing the same exact components that you’ve already thoroughly absorbed and charging you a second time to receive the same experience, only this time with absolutely no effort involved. I don’t think regular readers need to guess which side of the divide I rest comfortably on. Sequels are by definition an anathema to the very things we as consumers should celebrate, namely originality and creativity. They’re designed to rip you off, to eliminate the commercial and artistic risk involved in all worthwhile creative endeavors by offering something already granted a broad stamp of approval. As such sequels are cynical by design, thinking that an audience is so lacking in judgement that they’ll eagerly lap up regurgitated meals dressed up with fresh parsley and called a feast. Sadly audiences too often do just that and so we have an endless parade of sequels in everything that constitutes pop culture. Television reboots of twenty year old shows that had lost any reason for airing after eight years the first time around. Novels that update a story that’s already been told to a fitting conclusion. Movies that recycle 90% of the plot and 10% of the fun of the original. And now once again we have re-used song ideas which are even more compromised than any of their brethren from other walks of the entertainment field simply because they have far less time within their structure to come up with something new to cram in alongside the already familiar attributes needed in order to MAKE it a sequel in the first place! In this case that’s even more of an issue because it’s an instrumental, thereby removing the possibility for the lyrics to handle some of the burden. Wild Bill Moore, what were you thinking???? 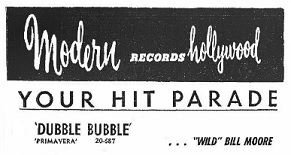 The reason why Moore was willing to compromise his integrity of course is because Bubbles was his first hit back in early 1948. It was not a very worthy hit however, which is the first problem we’re confronted with when addressing its obviously cleverly named sequel, Double Bubble. You need to keep in mind the environment that the original Bubbles came out of in order to fully understand the inappropriateness of revisiting it now. That song had been cut in November 1947 when rock had been around for all of two months, before it had quite figured out what needed to be emphasized to establish this music as something different and the record was released in January 1948 just as rock was in the process of scoring its first hits and curious listeners were seeking anything which might be related to it. In other words its timing couldn’t have been more perfect when it came to connecting with an audience that was still just beginning to process the musical changes taking place. Sax based instrumentals formed the main unit of the initial landing force of rock ‘n’ roll, with his cohort at Savoy, Paul Williams, leading the charge ashore (with Moore in tow on tenor to Williams’ baritone on those records) and Earl Bostic on their flank. The sounds these saxophones provided were the fanfare for the coming invasion that would see vocal groups, ribald solo singers and a whole host of reinforcements blowing ever louder and more obscene notes on their horns which would all conspire to overwhelm the senses and stir the passions of this new generation of listener eager for something different. But of those practitioners, at least these early sides from the sax players, Moore’s record was the weakest among them. Mildly pleasant melodically but hardly memorably so, slightly roughed up thanks to Paul Williams who provides a responsorial horn, but without enough time devoted to him to transform the mood entirely, Bubbles was a compromised track that somehow found an audience in some major cities, topping the Cash Box charts in Chicago and just missing repeating that feat in both New Orleans and New York. Though it never made the cloistered charts of Billboard which were gathered from more mainstream outlets, there can be no debating that it was a genuine hit record. But within six months it was an anachronism as a steady stream of sax instrumentals upped the ante with racier excursions and more seductive grooves. Moore himself would provide the coup de grâce for that milder approach with his scalding We’re Gonna Rock from July, which not surprisingly had been cut a month after the more pedestrian Bubbles, during which time the first signs of what was worth pursuing had become more clear. So while it’s understandable – though hardly admirable – for Moore and his new record company to want to hedge their bets a little in order to get him off the ground running (and you could certainly make the argument they did just that last time out too with the exhilarating Rock And Roll taking the spirit along with much of the title from his aforementioned gem from July 1948), the problem is by mid-1949 the rock audience had gotten to hear 18 months of new ideas, new sounds and new possibilities since the original had made waves and it was pretty evident what they consistently gravitated towards, and conversely what they tended to avoid. THIS was what they tended to avoid! So now that the decision itself has been ridiculed let’s get to the record which is deserving of some criticism of its own. We’ve seen a few instrumentals “harkening back” to prior records lately, most notably Sonny Thompson giving us Still Gone as a de facto follow-up to Long Gone from more than a year earlier. On the surface that probably doesn’t seem all that much different than this but where they differ greatly is in the intent. Thompson knew exactly what he was being asked to do but was far too independent minded and artistically proud to churn out anything so shallow, so he took some mildly recognizable vestiges from his earlier masterpiece and re-conceived them in fairly radical fashion. It hinted at what came before without being reliant on the same devices to connect on its own. 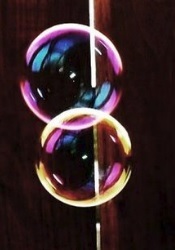 Not so on Double Bubble where Moore is much less inventive with the same exploitative task. Yes, he does alter the melody somewhat, but it remains so closely tied to the first go-round that unless you listen to them back to back you won’t be able to put your finger on what notes are actually changed. When you do hear them both you’ll be amazed that he had the gall to pronounce this a new song. Everything about it falls in line with the original rendition, from the horn’s rather bleating tone to the arrangement that features abrupt interjections in a lower range. The problem is Paul Williams on baritone presumably is not here, since he’s still recording for Savoy and Moore is now with Modern. Both were still situated in Detroit and so it’s conceivable that Paul snuck in, but it doesn’t sound like a baritone at all, but rather a tenor dropping down. On the other hand maybe it is a baritone, as becomes clearer later during an extended interlude, but if so it’s one afflicted with food poisoning. How else to explain the nausea-inflicted sounds it makes? When Moore takes over mid-way through things improve somewhat and I’ll even go so far as to say they make conscious improvements on the formula of Bubbles, as on that Moore was far too meek in his playing during the same stretch. Now he seems to realize that such demure passages won’t cut it with a much more savvy rock audience so he muscles up the tone a little to try and convince you he’s authentic in what he’s doing. At one point he even lets loose with a couple of high end squeals that are followed with a sing-songy riff and then capped off by his best moments in which he delivers a stuttering refrain that is actually quite good. Ahh, but here’s the rub… it’s housed in something that is NOT good. Not in theory and for the most part, aside from that fairly inspired thirty second stretch, not in execution either. What’s worse is that it’s all done with a blatantly crass objective and that’s not something that can be rewarded, lest we all are forced to suffer endless re-runs in every walk of life. I know that the object of record companies is to sell records, I’m not naïve enough to think they care about the artistic goals of their musicians or the cultural needs of their audience. So I’ll just say that I expect this kind of uninspired product out of them if left to their own devices. But I’ll also state unequivocally that it has to be resisted at every turn. Consumers – and that means record buyers and live venue patrons – have an obligation to reject such lazy efforts out of hand. Likewise record label owners need to realize that if an artist can connect with something original once it should mean you have the confidence in them as their employer to think they can do so again with something ELSE that’s original. If not then don’t pay them money to cut records and instead give them a job sweeping out the studio after it closes. A year and a half ago when Bubbles came out it may have been successful commercially but it was hardly up to par creatively, even then. 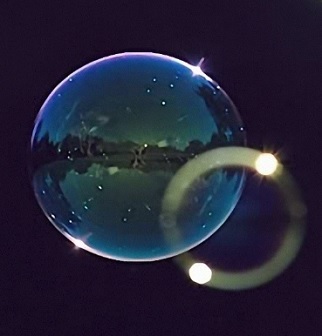 Though in a strict comparison, with each record listened to side by side, it’s conceivable that Double Bubble is equal to it, possibly even slightly better thanks to that one brief highlight, but too much has changed in the interim for us to grant it the privilege of being referred to as such. The context – our favorite word here – has to come into play. In January 1948 we could be mildly forgiving as to the first record’s shortcomings simply because of musicians and record companies having so little to go on when it came to knowing what direction to pursue in this new field. In July 1949 the direction is much clearer and therefore the excuses for not doing so become much less convincing. Moreover, Wild Bill Moore himself is now an established and respected figure with bigger hits, both his own and playing on Williams’s past records, to not have to return to something this out of date which gave him his first notices on the national scene in order to win us over. He’s already won us over with more recent releases featuring more aggressive and up-to-date sounds and that’s what we expect out of him from now on. That’s okay, we’ll forgive you Wild Bill for not trusting in yourself and for allowing yourself to be talked into cutting this record. We’re not throwing you out of the rock musicians union for one transgression. But that said we won’t absolve the record itself in the process… that’d be taking our forgiveness just a bit too far. 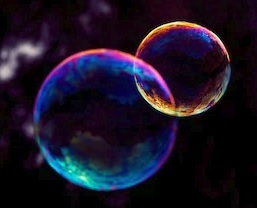 Leave a reply on "Wild Bill Moore: “Double Bubble”"